RAM buying guide, and guide to install compatible RAM. Click Start, Settings, and choose Printers. 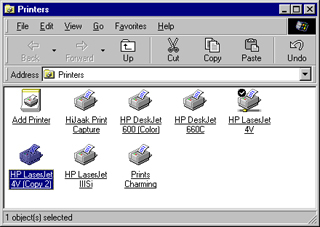 Right-click the printer that you would like to configure and choose Properties. 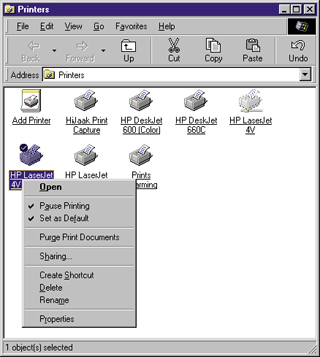 The printer properties dialog box will open. Click the Device Options tab. If your printer has an IEEE 1284-compliant parallel cable, your printer may have reported the memory information to Windows 98. 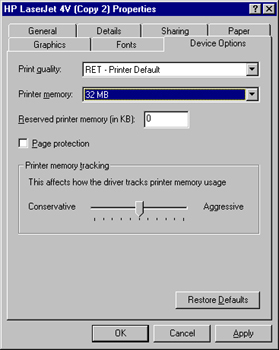 If the printer memory field is unavailable, your printer does not support this feature. 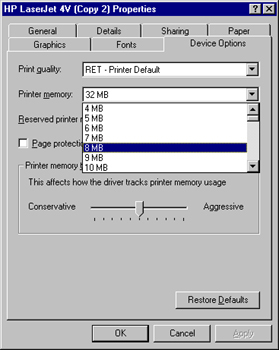 If you have added memory to your printer, and the changes are not reflected on the Device Options tab, click the printer memory drop-down list and choose the total amount memory in your printer. Choose OK to confirm these settings. After successfully setting the memory, close the printers folder by clicking on the X in the upper right corner. How Much Memory (RAM) Is Enough? What are different kinds of Memory Upgrades? Visit the forum to post your Questions.